Immediately after the deadly Sept. 11, 2012, attack on the U.S. consulate in Benghazi, Libya, partisans expressed similar interest in the story. But the partisan divide widened as investigations into the attack unfolded last fall. 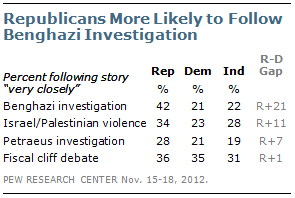 In mid-November, 28% of the public said they had followed that week’s news about the Libya investigation very closely. Republicans were 21 percentage points more likely than Democrats to say they had followed this news very closely. Among the GOP, 42% said this, compared with 21% of Democrats and 22% of independents. Today, U.S. Secretary of State Hillary Clinton heads to Capitol Hill to testify about the violent attack that led to death of Ambassador Christopher Stevens and three other Americans. Clinton can expect tough questions from Republicans who have been harshly critical of security precautions at the consulate.